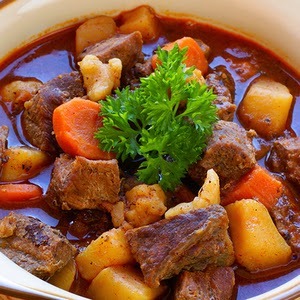 Authentic gulyás is a beef dish cooked with onions, Paprika, tomatoes and some green pepper. The meat will probably let out its own juice, let the beef-cubes simmer in it while adding the grated or crushed and chopped garlic (grated garlic has stronger flavour), the ground caraway seeds, some salt and ground black pepper, the bay leaf, pour water enough to cover the content of the pan and let it simmer on low heat for a while. Bring the soup to the boil and add the csipetke dough, it needs about 5 minutes to get cooked. Beat up a small egg, add a pinch of salt and as much flour as you need to knead a stiff dough (you can add some water if necessary). Recipe taken from the Budapest by locals.